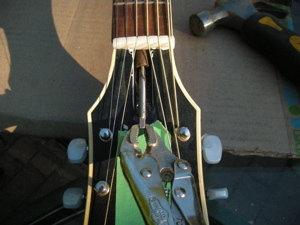 Louie7 : During a recent Sovereign neck reset, I found it ness to remove the fingerboard to resolve a radical neck-warp. 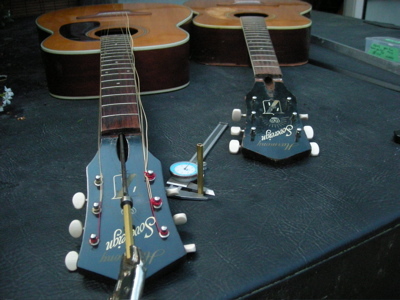 Naturally, I removed the TRUSS-ROD for examination and service. What follows is a series of photos that, I hope, graphically illustrate the type and workings of the Sovereign Rod. As you can see, it is a dual rod - but it is not a Bi-flex rod. It corrects concave bow only. Study it's characteristics carefully. It works well in one dimension. Fran�ois : Thanks a lot for these very valuable pictures Louie ! Sure it is a simple action trussrod, but don't you think this can be efficient enough "in real world" ? 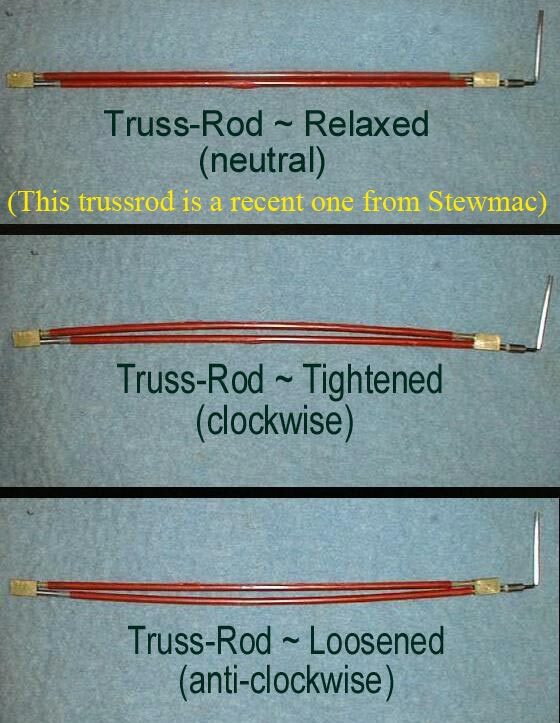 I mean, we see here the trussrod out of the neck, but when a straight neck is under the string tension, it takes a normal bow, and the trussrod is here to adjust it with just the right amont of bow.. (plus, in older guitars, the neck often has a bow even without tension). Louie7 : Yes....I do believe that in MOST cases the stock 1-way rods are fine. Let me point out, however, that I'm seeing more and more conVEX bowed necks - whether they be on acoustics or electrics. Point of fact, this VERY Sovereign has a serious back-bow that caused the fretboard to dip back starting at the 3rd fret WITH the rod completely relaxed. Therefore, I had no choice other than to remove the board and plane the neck level. 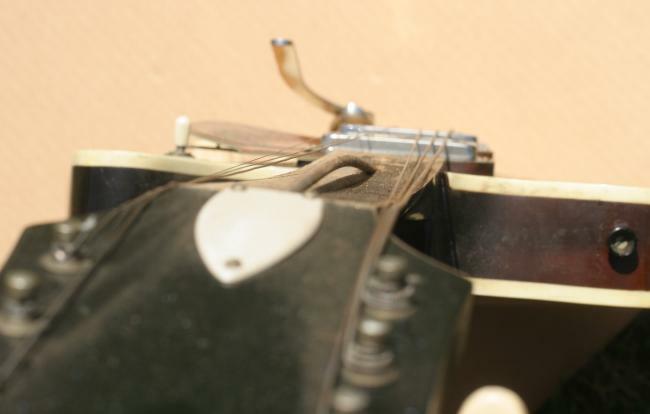 This was the primary reason leading to the removal of the TRUSS-ROD. I have two Fender electrics for which this problem exists....although not as extreme as the Sovereign. I rely on heavy guage string tension to counteract this tendency, because I really DON'T want to remove the boards on these vintage necks. I wish I knew what caused this kind of back-bow. It's annoying and difficult to deal with. I even see it in new guitars sometimes. I attribute this to poor craftsmanship in asian countries. Of course this is not to say that it can't or doesn't happen here....it's just that I work on SO many imports...it's frightening. It's to the point where I'm shocked and amazed when a real Gibson or Fender or Martin comes in. And as a footnote...let me state that there was a GREAT deal of rust and (mostly) glue that had to be excavated from the channel before I could remove the SOV rod. I don't know to what degree this kind of thing inhibits the 'action' or usefulness of the rod. I tend to think not much...but I just don't know. Howmany : In the 70's I worked in a music store that was owned by a violin maker. With some "warped" necks (reversed bow) with non-adjustable or stuborn truss rods, he taught me to place the end of the guitar on the workbench, rest the back of the headstock on my shoulder, place your hands on the neck near the nut and near where the neck joins the body.....and bend! This actually worked on occasion. You'd have to be sure you were working on a VERY STRONG guitar. I don't recommend this procedure to anyone.....this stream just made me think of this old technique. Do not try this at home! The better way was this huge hot iron we had to to place on the fretboard, heat her up, and then clamp with some wood spacers to correct the problem bow or warp. This was more efficient and much more civilized! PS: You should have seen the look on my customer's faces when they saw me trying to bend the sh$t out of their guitar neck... it was worth it whether it worked or not just for the laughs ! Simon : This truss rod talk is really helpful...it seems to me it's the biggest mystery in guitar fixing. You can't SEE what's going on. Between this site and Francois' site and Frank Ford's site, I've got the beginning of a handle on it. I've gotten pretty comfortable pulling rods. 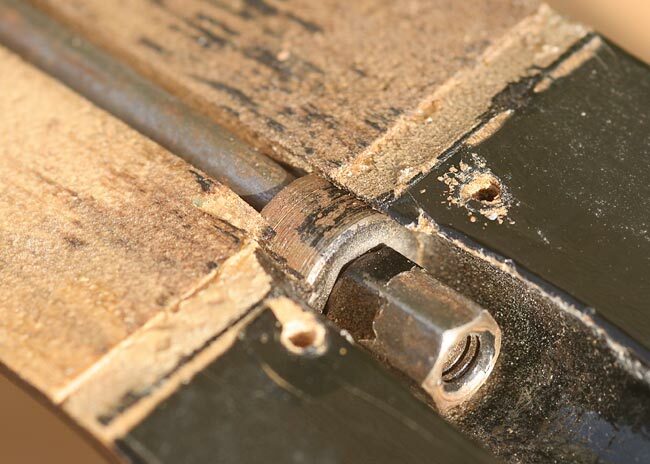 A good rod is simple...remove the nut, spin on the Frank Ford inspired drilled and tapped hex rod puller (as shown in the jaws of the micrometer) grab it with the vise grip, protect the headstock, and tap it out with a hammer. A broken rod is a little more fussy, but follow Frank, and it WILL come out. I'm talking right now with a young machinist who's going to make me some 'mushroom washers' and I would love to be able to offer repro rods to all who want them. But my question is...which other Harmony guitars use the same rod as the Sov? 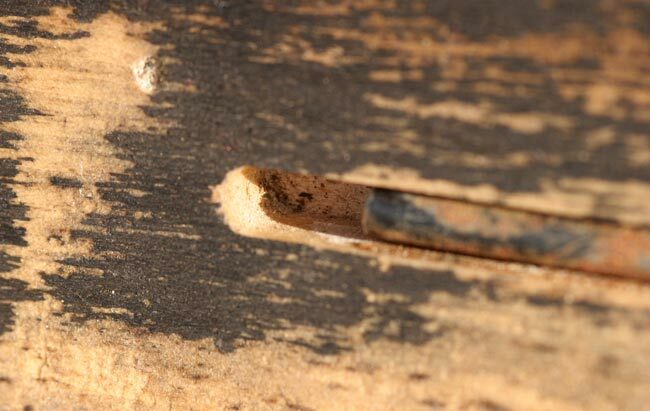 The H6685 truss rod pocket looks the same as the H6560 truss rod pocket. The pictures I'm posting here are of 9755 H6560. 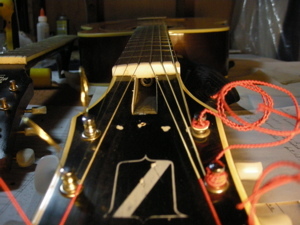 The date is unreadable, but the guitar is ladder braced and in every detail identical to 8575 H6560 which is dated 1972. 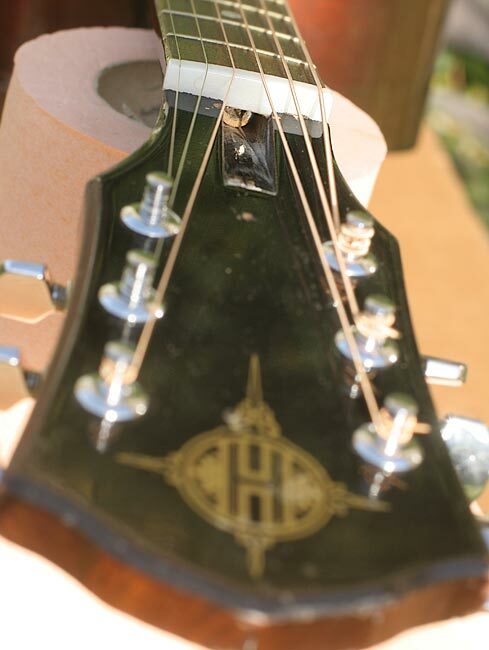 When I first looked under the truss rod cover I thought I was looking at the mushroom washer, so I twisted a tap into the hole, clamped the vise-grip on and started hammering. A good detective would have been suspicious sooner than I was, I guess I just like hitting things. By the time I stopped to examine why it wasn't coming out, I had opened two cracks in the neck under the nut. I loaded them with glue and tapped the rod back in. I looked more closely and saw that a 3/16" allen wrench is required to adjust the rod. 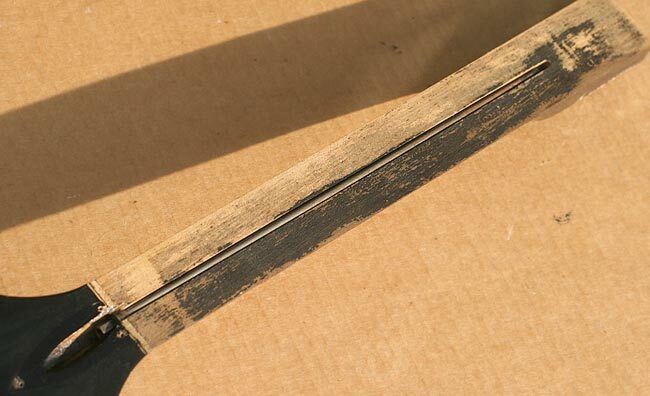 I'm very interested to know what that truss rod looks like under the fingerboard. The only other clue I can offer to help identify the origin of the 'square pocket' neck is that the headstock of 9775 has the typical Harmony add-on mahogany wings (so that the one piece neck/headstock can be cut from wood that is only 2 1/4" wide). 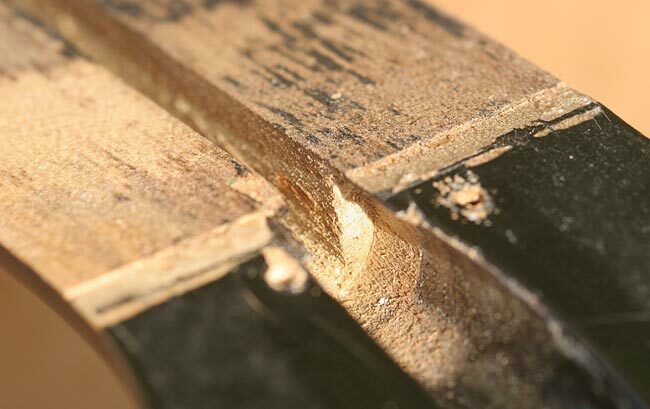 I don't know if Asian factories built differently, and I do believe I can see that telltale glueline on the photo of the back of the headstock of the H6685 on your website, so this little fact may be inconclusive.